The flowers are in bloom and your car has that familiar coat of yellow pollen. You know what that means—Spring has officially sprung in Atlanta! It also means Atlanta’s farmers markets are back for the 2016 season, offering up seasonal produce, meats from nearby pastures and other delicious products created by local food artisans. Visiting your local farmers market also gives you a chance to connect with your food and community that shopping in a grocery store doesn’t. The man handing you your carrots at the farmers market is probably the same one who pulled them out of the ground. The woman packing up your eggs likely collected them that morning. Best of all, Atlanta has so many farmers markets that chances are you probably live by one. So, grab your reusable bags and head to one of the city’s top 10 farmers markets! Did you know? Through a partnership with Wholesome Wave Georgia, SNAP benefits are doubled at each of these markets. Location: Piedmont Park’s 12th Street and Piedmont Avenue NE park entrance. In the heart of midtown sits Atlanta’s own version of Central Park – Piedmont Park. Every spring the Green Market pops up on Saturdays, bringing about 45 vendors with it. Farmers, such as the ones from Lucky Leaf Farm, will sling produce and fresh cut flowers. You can take comfort in knowing that all of the fruits and vegetables are squeaky clean, only organic produce vendors allowed! Cool off under the trees while you scout out some veggies for the week ahead – or snag a scone from Seven Sisters (we won’t tell). The one “must have” locals swear by? The iced coffee from Blue Donkey, available every week from their mobile coffee cart. As if downtown Decatur wasn’t already perfect, with its charming square and MARTA accessibility, it has a market that gives you a chance to shop not just once, but twice a week. This means you can grab some veggies after happy hour or brunch at one of Decatur’s best restaurants. For produce, look to The Funny Farm, based out of Stone Mountain. For berries and fruit visit the farmers of Mountain Earth Farms. This market, along with Grant Park, Westside and East Atlanta Village is part of the My Market Club, a partnership between Georgia Organics and Community Farmers Market. Each time you visit one of their markets, they reward you with swag like gift cards, bags and market goodies. Like to sleep in, but still want to support local? 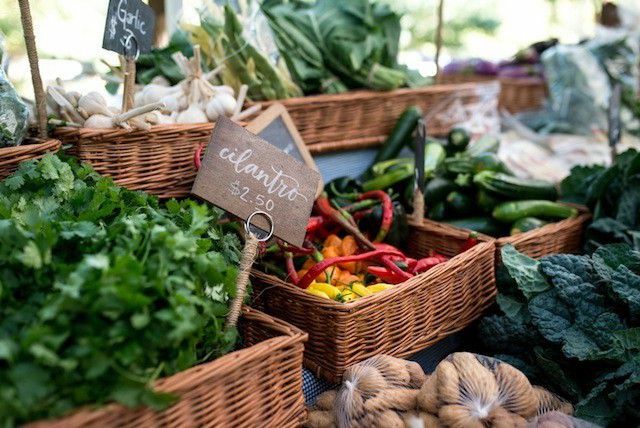 You’re in luck, because the East Atlanta Village Farmers Market doesn’t start until 4:00 p.m. A staple of the neighborhood, the market sets up shop in a park with its own edible garden—perfect for the kids to explore! With nine farm vendors offering vegetables, fruit, mushrooms and flowers you’re sure to find some fresh goodness. Along with local vendors, the market also draws the community together for events like their fall potluck and chili night. Nothing like a little locally grown kumbaya. A heavenly farmers market can be found in the Cathedral of St. Philip parking lot, where the Peachtree Road farmers market appears every Saturday. Fun fact: it’s the largest producer-only farmers market in the state, meaning everything in the market has been grown or raised by the seller. With over 50 vendors, you’re bound to leave a satisfied customer. Hungry for more? There’s also fresh art by local artists for sale. Pro-tip: Get there early to ensure easy parking and first dibs on the best goodies. Set in Atlanta’s fourth largest park, the Grant Park Farmers Market offers you a chance to shop in a historic urban setting. This is also the place to be for a chance at a celebrity chef sighting. Past chef demos have included Hugh Acheson, Virginia Willis and Steven Satterfield. After a little chef-spiration, peruse the market and grab some produce from vendors like Cosmos Organic Farm. This farm is over 100 years old, but has recently transitioned from a conventional to organic farm providing customers with healthier options. Work up an appetite after all that shopping? You’re not far from Ria’s Bluebird, one of ATL’s best brunch spots. Downtown workers, rejoice! There’s a farmers market just for you. The Peachtree Center Green Market offers office dwellers and conference visitors alike the chance to shop at Atlanta’s only downtown green market. Grab locally grown produce from Cosmos Organic Farm, raw honey from Bee Wild and jams from Merrily Gardens. The market conveniently falls during the lunch rush, so posting up with a fresh-baked cookie from Sweet Sassy Molassey Bakeshop while listening to live music is strongly encouraged. Some say the Westside is the “best side,” and it’s hard to argue when it has a Sunday market just a few feet away from beloved brunch spot, West Egg Café. With about 15 vendors, the Westside Farmers Market is small, but mighty. Here you’ll find a solid variety of vendors selling produce, honey and fresh cut flowers. You’ll also find noshable items from vendors like the Little Tart Bakeshop and King of Pops. Go for the fresh produce from Watsonia Farms, stay for a bagel and schmear from Emerald City Bagels. Or maybe a whoopie pie from Gimme Whoopie… If you have trouble saying no to locally made baked goods, hop aboard the Farm Mobile. This traveling truck offers a curated selection of meats, veggies and goods from local farms. Other farm vendors include West Wind Farms and King of Crops. Yes, the people of King of Pops have a farm where they grow a variety of fruits and veggies for their pops, and they’ll be selling them with you. For a truly unique Farmers Market find, swing by the 2 Fun Guys booth for a mushroom log. Yes, an actual log that’s been inoculated with bacteria and sprouts edible shiitake mushrooms. The newest addition to the farmers market scene, Ponce City Farmers Market will also be the first to sit on the BeltLine. Walk or bike down the BeltLine Tuesday evenings and stop by The Shed behind Ponce City Market. You’ll be able to pick up fresh produce from urban farmers and artisan food goods. Centrally located in Freedom Park at the Carter Center, this market offers plenty of parking, Beltline accessibility and delicious seasonal treats. With over 30 vendors, the market sees a lot of rotation throughout the year depending on the season. Most markets are only open in the summer and fall, but Freedom is year round giving you a chance to buy local winter produce like turnips and collards. Don’t leave the kids at home! Freedom Farmers Market always has tons of kids’ activities to entertain the tots while you shop. If you say N-O to GMO’s then you’ll want to scoot on over to the Morningside Market, the only market to require all produce vendors to be certified organic. Even if you’re not much of an herbivore, though, you’ll still leave happy with tasty offerings from 26th and Popped gourmet popcorn and Xocolatl chocolate. Save yourself a trip to Decatur and grab a loaf of bread from La Calavera Bakery.